A composite image showing the motion of Pluto relative to background stars. 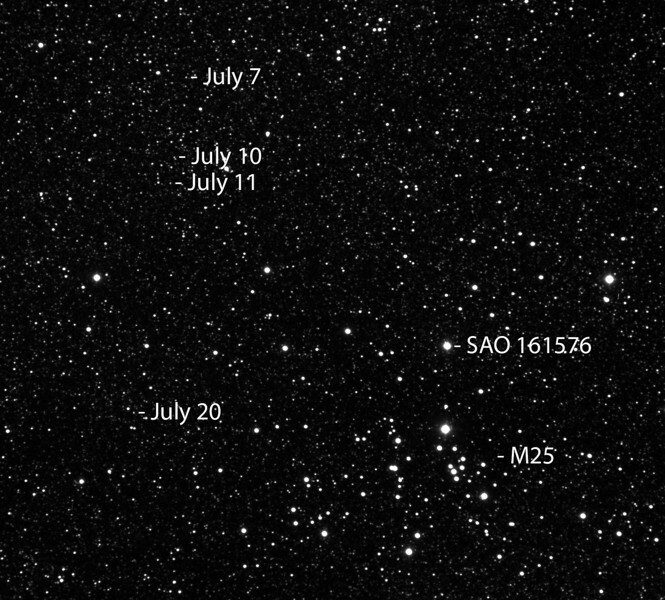 Ten 60” images of Pluto were taken on July 7, 10, 11 and 20 2012 for a total of 40 Images. Each group of ten Images were aligned and combined in MaxIm to produce a single image for each night. These images were then aligned in MaxIm. The final composite image was created in Photoshop where captions were added. The images were taken at the Lorenz Observatory through an Astro-Physics Starfire 130 and an ST8300 CCD camera.